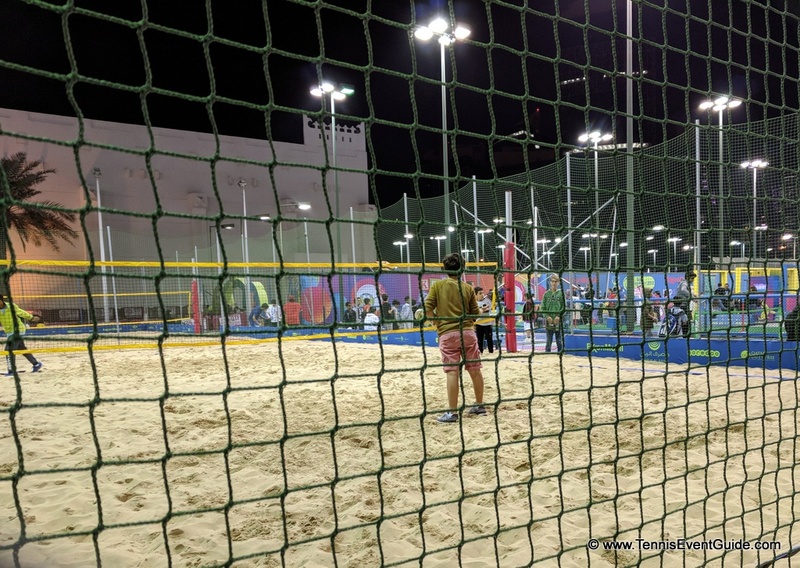 What is a tennis fanatic to do on an expected 18 hour layover at Hamad Airport in Doha the first week of January? 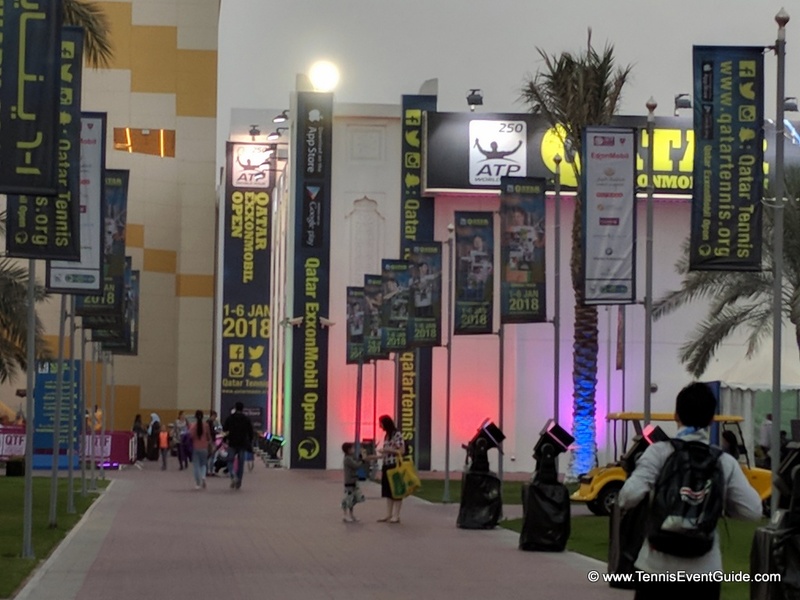 High tail to the Qatar Tennis Open Doha, of course! 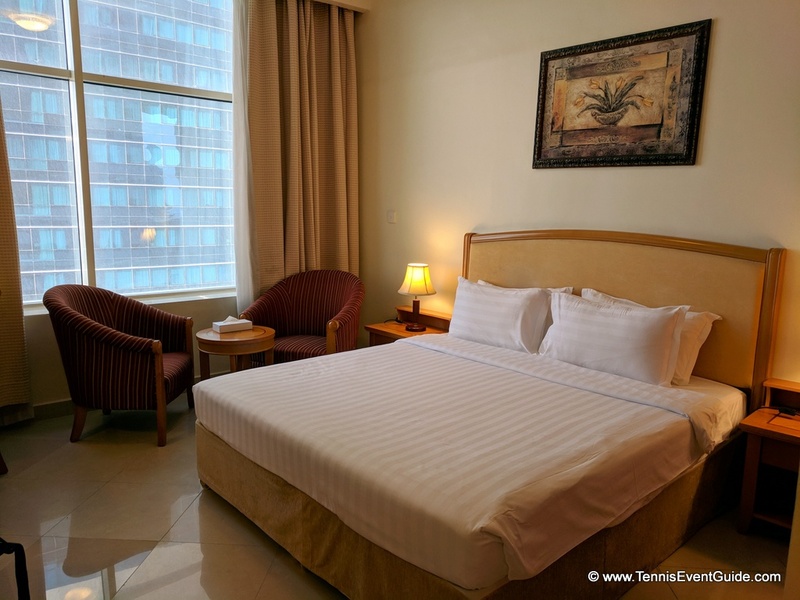 Within minutes of landing in Doha, I had booked myself at the Ezdan Hotel and Suites (less than a 10 minute walk to the tennis center), found out they still had plenty of tickets and grabbed a taxi about 20 minutes from the airport. My easy to get and cheap tickets were practically on the court and I watched some amazing tennis! Best.Layover.Ever. 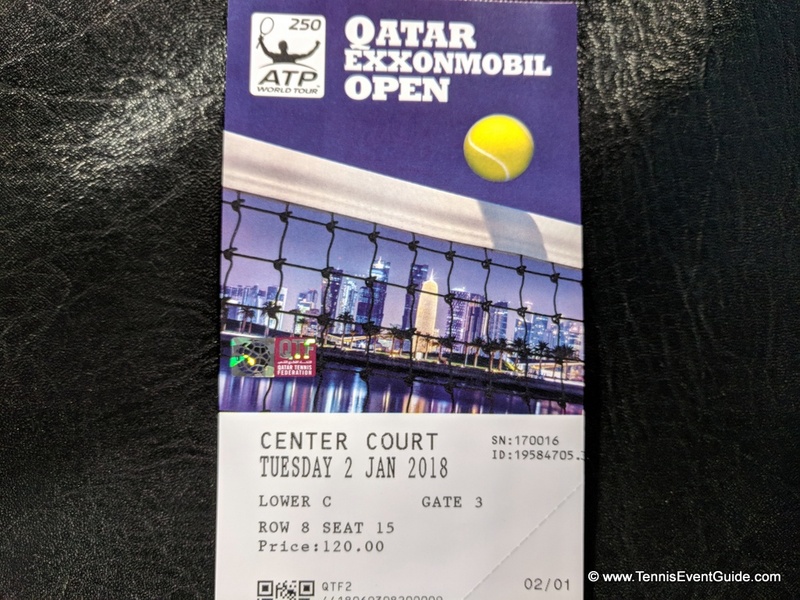 Many of the world’s best tennis players start the new year at the Qatar ExxonMobil Open, one of two ATP World Tour events held in the Middle East and held every January. Prior winners include Roger Federer, Andy Murray, Rafael Nadal and Novak Djokovic, with Nadal’s haul including the 2014 singles title and four doubles crowns (2005, ’09, ’11 and ’15). Djokovic won back-to-back titles in 2016 and ’17. Play starts at 3:30 pm and each of the 4 courts (Centre, 1, 2 and 3) hosts 4 matches in a row, which means my $40 ticket got me into almost 16 matches!!!! The Ezdan Hotel and Suites offers over 3,000 rooms and as the largest hotel in the Middle East, I highly doubt it will ever be sold out. I was in the apartments, which were dated, but clean. After all, this was a layover for me and a place to drop my stuff. My one night cost me around $50 and my only complaint is the total lack of outlets in the room. They are all hidden behind furniture and being used for the hotel’s amenities like lamps and TVs. The rooms definitely need updating for modern times but for the price, location and other amentities, you can’t beat this place. Those looking for a more upscale experience will want to choose the Four Seasons (where the players stay and many of the open-related events are hosted) or the Marriott. 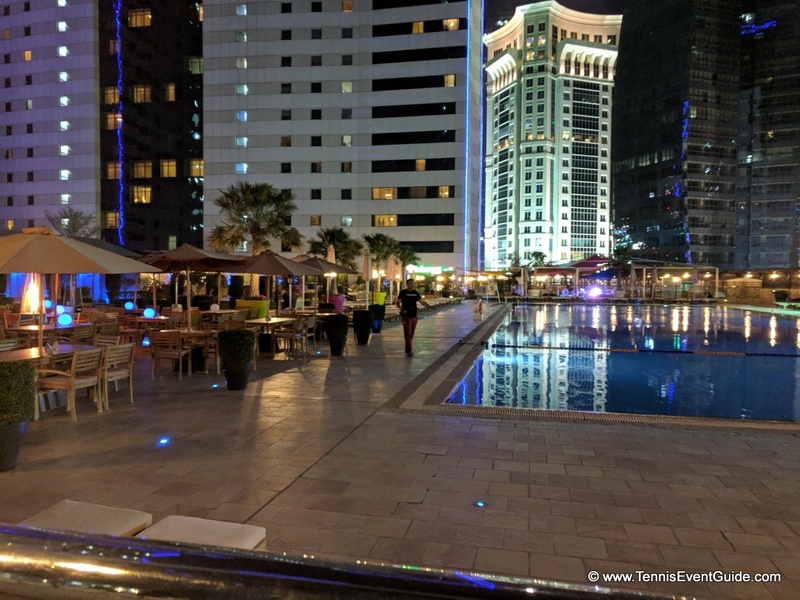 The hotel amenities are amazing, with tons of dining options, a mini shopping center with a grocery store, huge outdoor pool, a fitness center and more I didn’t even get to explore. 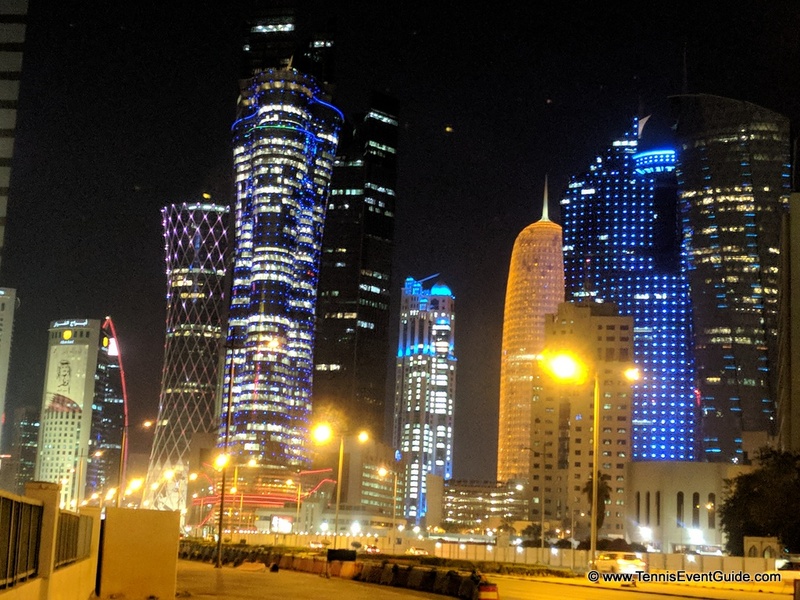 The Doha skyline is actually quite lovely and totally different than whatever image I had in my head. 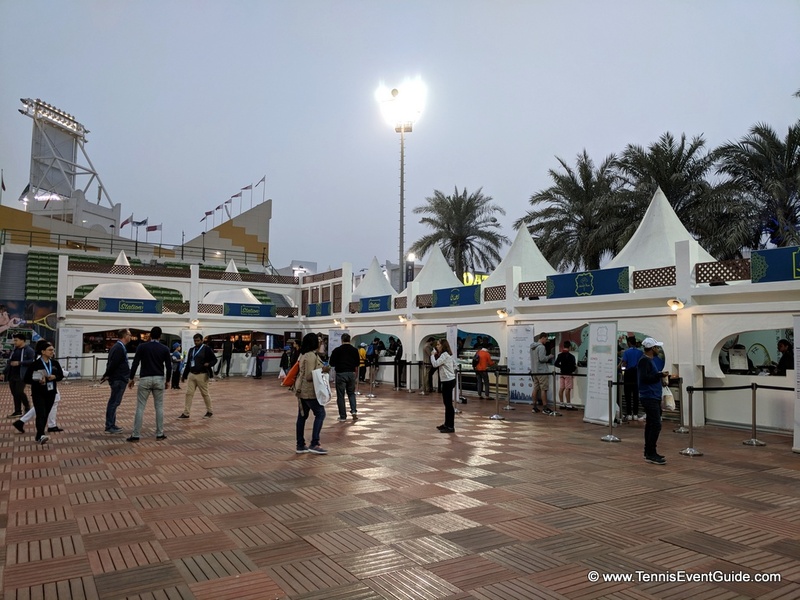 After checking in at Ezdan Hotel and Suites, I walked less than 10 minutes to the Khalifa International Tennis and Squash Complex. Although the walk was a bit tricky (more so on the way home) as there is a lot of construction and one way roads, it was easy to find. 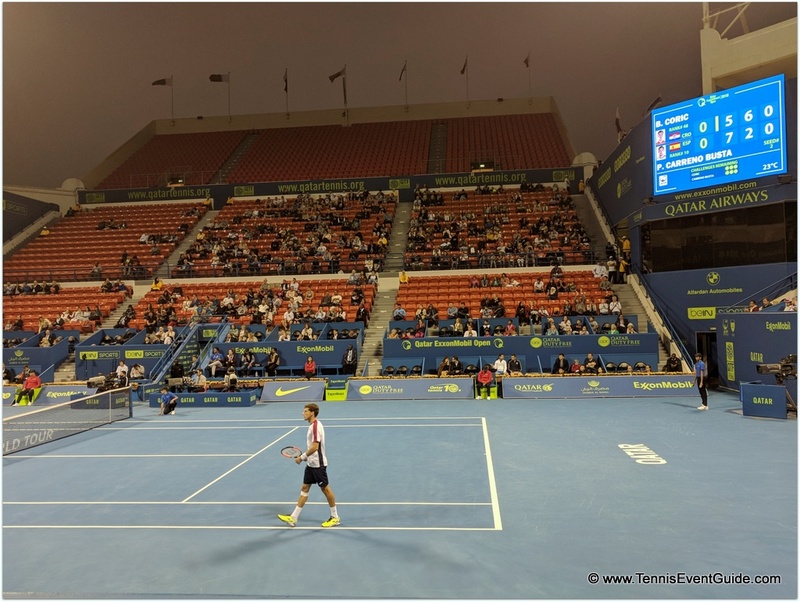 Within minutes and a splurge of $40 I had a front row seat to the Qatar Open and the order of play which included: Coric, Busta, Berdych, Gasquet and Monfils all playing on Centre Court that evening! Whoop Whoop! 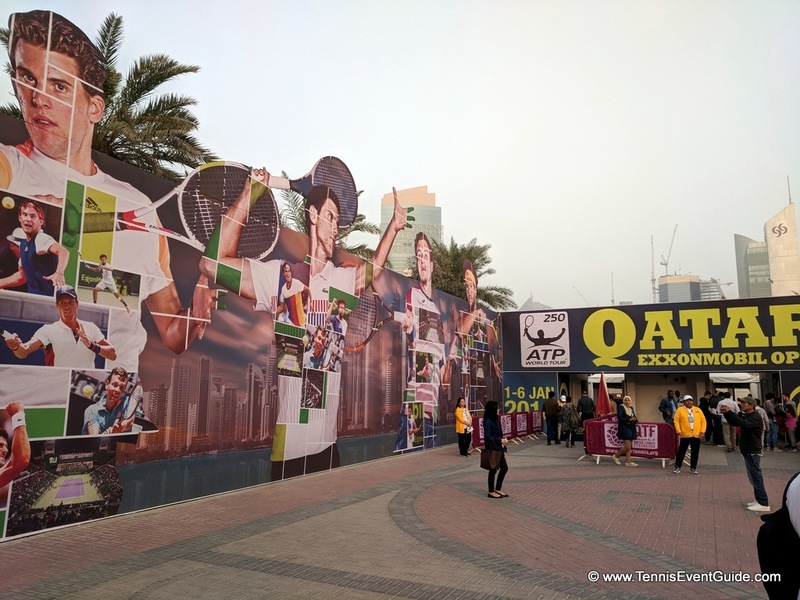 You know you’ve arrived at the Qatar Tennis Open walking this path. 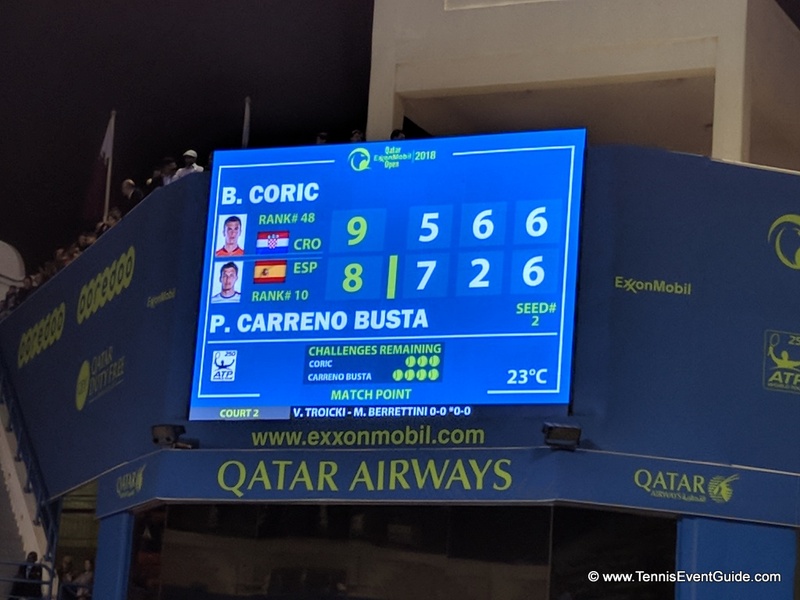 My seats were practically ON THE COURT as I watched a super-competitive edge-of-your-seat (I don’t even know who to root for, this tennis is just so good) match where Borna Coric finally beat second-seeded Pablo Carreno Busta after a close 10-Point Match Tiebreaker. Then I watched Struff beat the third-seed, Berdych in another close match. This might be the best $40 I’ve ever spent. Between sets, I headed out for a snack where there were plenty of choices at very reasonable prices. Local foods and artisans, Italian, Japanese and more, with lots of seating and outdoor TV’s so you didn’t miss a minute of tennis. 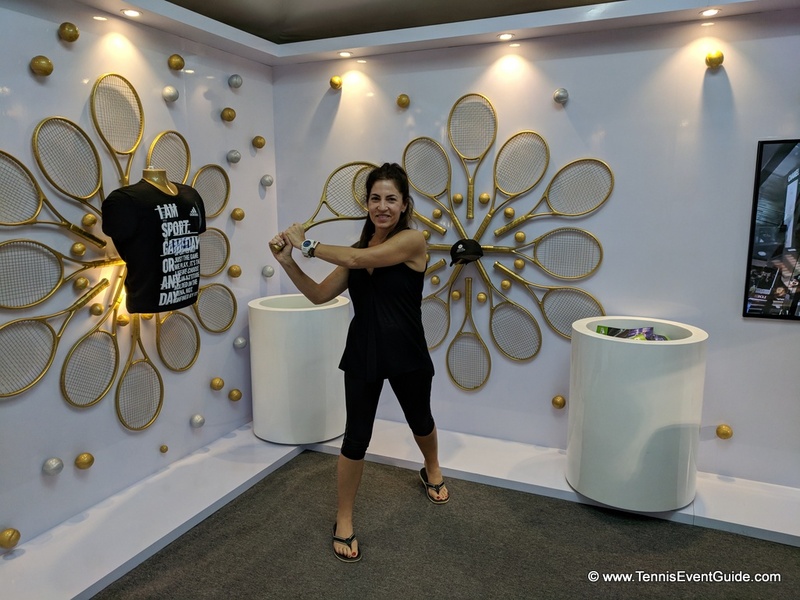 And played a little myself at the sponsor booths and kiosks (clearly I won’t be playing Pro Tennis anytime soon) but who doesn’t want a solid gold tennis racquet? Overall, the Qatar Tennis Open was a great event and I don’t think anyone has ever nailed an unexpected 18 hour layover better than this!